Day 2 - I made this Geometric card insert for our great friends Dre and Melody. It is my absolute favorite! It took 3 hours to plan out and cut. Then I added a few calligraphy touches and put it in a see through envelope. Day 3 - I made this card for my bestie, Suleky. She is an event coordinator, a real visionary for all things beautiful. I first made the triangle watercolors and then had no idea what to write on it. It looked like a puzzle to me so this is what I decided to write because she makes everything fit together perfectly. I made a custom grey, almost periwinkle ink for the calligraphy. Lovely. Day 4 - I was so inspired by feathers I had seen that I wanted to try and watercolor a few. 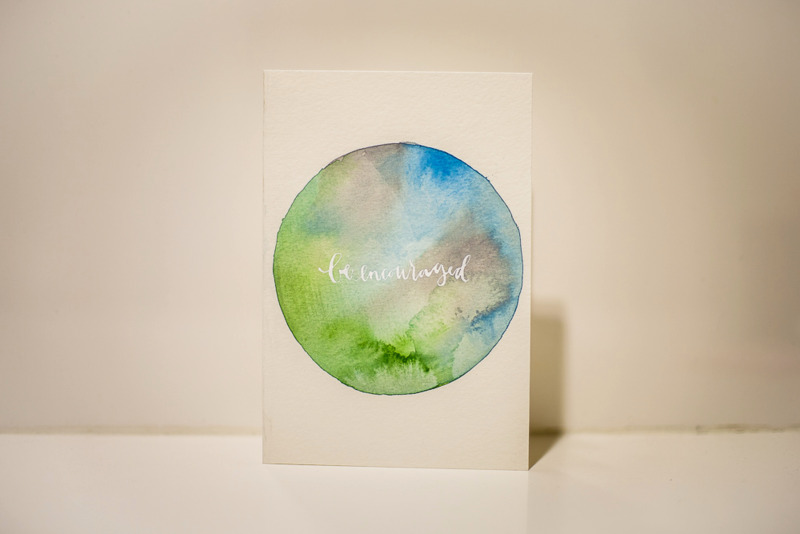 I had some green and blue watercolor leftover so I made these. I made this card for my amazing friends Katherine and Kristine. They are twins, book lovers, whovians, 1D fans, writers and everything else wonderful in this world. They are so amazing, they deserved something unique and beautiful. Day 5 - I wanted to make something clean and refreshing for my sister. She is amazing in every way and I thought this would be a perfect card. I loved the geometric envelope enclosure I made earlier and I had leftover green paper I wanted to try it with. I used the same green paper for the card and a darker green scrap paper for a leaf. Calligraphy was done in Doc Martin's Bleed Proof White. Day 6 - I made this card for my sister in law. Its not as ornate, as lovely or as refreshing as she is but nothing I could make would be perfect enough for her. This was made with a simple watercolor mix and white calligraphy. The white was a little too watered down but I had to make it work at this point. Day 7 - I made this card for a dear friend of a friend, Chrissy. She was on my heart for weeks so I decided to make her something special. She is lovely in every way and a cancer survivor. This card took me 1 hour to plan and 2 hours to cut. I glued an ivory shimmer paper on top for writing. I loved this one. Let me know what you think of this week's cards and if you have any ideas for me! I am still on the look out for inspiration, color schemes and designs!